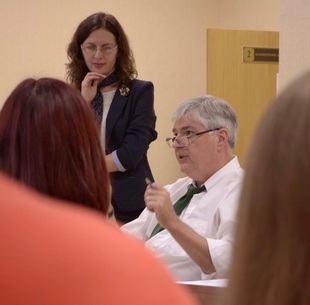 In April 2014, through Community Connections, a US State Department program, a group of ten Belarusians interested in mediation came to Raleigh to spend three weeks visiting with mediators in the Triangle. 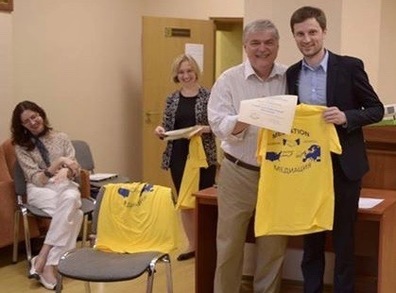 After they returned to Belarus, Frank Laney was invited to return the favor and come to Belarus to talk to mediators there about our programs and processes. The group of Belarusians were about divided between lawyers on one hand and psychologists and educators on the other. Earlier in the year, Belarus had passed a law establishing the practice of mediation and had just adopted rules for training and certification of mediators. I left Raleigh on Sunday afternoon, March 29, 2015 and flew through Atlanta and Amsterdam. The Amsterdam airport was a mess. Despite being there for eight hours before my delayed plane left, I almost missed it. I arrived in Minsk late Monday afternoon. Arseny Dzhanashia met me at the airport, where he had been waiting for me for hours. We rode into the city in a micro-bus, a 15 passenger van. Outside the railway station is the central exchange point for such micro-buses, so we got out there to wait for our next bus to Mogilev, Arseny's home. To pass the time, we walked down the street to a shopping mall and had a bowl of soup. By the time we caught the bus to Mogilev, it was well past dark and both of us dozed during the hour and a half ride. The road was a new super highway with not much to see out the windows but fields, forests and a few houses. In Mogilev, Arseny took me to his one bedroom flat, which was clean and neat, but not fancy, much like college student housing in most of the world. He left to go stay with his parents but promised to pick me up the next morning at 8:00 a.m. to go to A A Kuleshov Mogilev State University where he teaches psychology. The next morning he arrived a few minutes after 8:00 a.m., to find me snoring in bed. The previous evening, in my travel haze, I had set my alarm for 7:00 p.m. not 7:00 a.m.. I jumped up and took a quick shower while Arseny checked his emails. We left by 8:30 a.m. and a university van carries us to campus. Mogilev University is like many city universities in that departments are in various buildings scattered across the city and the buildings are fitted in between other commercial and residential high rises. Arseny showed me to the campus canteen or cafeteria. A breakfast had already been laid for us. I came to find that this table was reserved for me for the rest of my stay. I had a tomato and cheese salad followed by rice with a type of sausage that included breading, like English sausage. Hot tea was served with every meal. After breakfast, I met Arseny's dean, Irina Komarova, the dean of the Faculty of Psychology, who was very warm and welcoming. She presented me with a foot tall Belarusian doll, linen towels and a carved Russian doll, my presents. After a quick cup of tea with Irena, we went to meet the vice-rector of the university. We exchanged pleasantries and I told him of my purpose in being there - to teach people about mediation and to advance social skills in peacemaking and self-determination. Our conversation was recorded and part of it was later shown on a local TV station. I was given a tour of the university, including a nice museum showing the history of the institution. There was a special display about President Lukashenko, who graduated from Mogilev University. I was told I was the first American to cisit the university and that my being there was a tremendous honor, but I assured them the honor was min. We went to a large auditorium where I was introduced and spoke for almost two hours to 150-200 students and faculty. I talked about the basics of mediation and the uses of its principles in law, psychology and education. The students and faculty asked a number of very good questions. Arseny took me back to the cafeteria for another special meal. As I am not a big fan of hot tea, I asked if they had anything cold to drink. Whereupon I discovered compote. It is a fruit medley with whole fruit in the bottom of the glass. I loved it and ordered it for the rest of my stay. My friends found it amusing, as the locals view compote as being a peasant beverage. I said call me peasant, because I love it. After lunch I gave a three hour lecture to a seminar that Arseny teaches on mediation. There were sixteen students, plus a faculty member or two in attendance. I covered a number of issues, including an overview of the range od dispute resolution techniques and the various settings for the use of mediation in North Carolina. I also talked about the Fourth Circuit Court of Appeals mediation program and the use of mediation by telephone. To mix things up, we did the Orange Auction exercise which the students enjoyed immensely. The students were very attentive, asking many thoughtful questions. Frequently my answer began with "that is a hard question and will require a complicated answer." They asked the most challenging questions of any group to which I think I have spoken. Throughout the day I was translated by English professor, Evgeniy Samsonov, who proved to be an excellent translator. He and I have been Skypeing since. I get up early and talk to his English classes about life in America. During a break in the lecture, about 4:00 PM, I went to a visa control office in the university to register my stay in Mogilev. As one of the people who had to sign off on my papers was gone for the day, I was asked to leave my passport in the office overnight. I did so with trepidation and only after asking the very nice clerk to write out the name and address of the office so that if anyone stopped me asking for my passport, I could at least give them the paper and explain that is where it was, since I had no idea how to explain where I was. At the end of the day, a young lady appeared in the class and sat quietly in the back. As we were leaving, I was introduced to Alice Baranova. She said that she was my translator for the evening, which left me slightly puzzled. While Arseny and I do not communicate fluently in English, we are always able to get our point across and I have no trouble understanding what he is telling me. I believe that Arseny finds English a struggle, because when we are alone we get by, but if there is an interpreter present, Arseny prefers using the translator. Arseny, Alice and I left the university, walking toward the central part of town. We walked past large government buildings, a music college, thru narrow streets with quaint little buildings now mainly shops and saw a very tall artistic statue of an astrologer and his telescope. Arseny talked about our surroundings and Alice translated. The astrologer is the world's only public statue of an astrologer. We walked back to the main street near the university where we caught a bus to Arseny's flat. Arseny fixed supper for us, including cold borscht, while I chatted with Alice. Her family owns a company that upholsters furniture. She is a second year student in college but is only 18 years old. Her major is English and she wants to be a translator, but as those jobs are hard to find, she thinks she will probably be an English teacher, a prospect she does not particularly relish. ​The next morning, Arseny took me back to the university cafeteria for another delicious and hearty breakfast at my reserved table. I got compote without asking for it. We then rode a university owned van out of town about 15 miles to visit Buinichi Field, the site of a great battle early in the Great Patriotic War (World War II), where a Russian army held the Germans up for several critical weeks in July 1941. At the field was a simple but impressive monument to Konstantin Simonov, a Russian writer who witnessed many battles, wrote a moving poem about Buinichi and asked to have his ashes scattered there. There we met Alice, who again translated the information Arseny relayed about the site. Across the road was a reconstructed village with artisans in each house – weaver, potter, wood carver, blacksmith and so on. I bought several souvenirs for my family. It was the last such purchases I would make, as everywhere I went, I was showered with presents such that I had no need of additional mementos. The van then took us to the old town section, overlooking the Dnieper River. When Alice told me it was the Dnieper, I did not believe her, as I knew the Dnieper flowed into the Black Sea, far to the south. But once I consulted a map, I saw she was right. It also explained why in the Middle Ages Mogilev was a major trading center, as it had river access to the Black Sea and the Middle East. We visited the historic town hall and an impressive memorial to the patriots who won the War, including an eternal flame. We went back to the university for lunch, where I met the coordinator for international events and visitors. He joined us for lunch, spoke perfect English, and returned – to my relief – my passport. After lunch, Arseny gave me another bag of presents, including an I (heart) Belarus bag, a flag of Mogilev and a box of chocolates called Bird's Milk, the first of my growing collection of fine Belarusian chocolates. Once I understood the name, I commented, "Ya'll don’t really understand how birds work, do you?" I also met Elina Kotlarova, head of the Psychology Department and Arseny's boss. She had attended both of my lectures the previous day and had asked a number of questions. Although our communication in English was spotty, we struggled on, with her excitedly showing me the classrooms and student projects. Arseny and I walked from the university to the nearby main road, where we caught a minibus to Minsk. This time the trip was in daylight, so I got to see the Belarusian countryside. The land is very flat and looks well watered. The soil is almost black due to its richness. It was early spring so no crops were growing in the vast fields. Any area not being farmed was covered in tall forests of pines and birches. Everything was neat and well maintained. Although the houses and buildings were small and simple by American standards, everything was cared for – I never saw any trash along the roads anywhere I went. The people obviously care about and take pride in their land. We arrived in Minsk about 5:00. Up to this point it had been cloudy every day, but with no significant rain. In Minsk we disembarked and waited on the sidewalk for a ride to my next place to stay. It was windy and even snowed a few flakes. This was the only time I got cold while in Belarus. The locals were always much more bundled up than I, but I was generally warm. Maybe my working hard and energized with excitement kept me warm. But my hosts were constantly concerned that I was underdressed. It was clod and cloudy my entire time in Minsk – it snowed some every day. In a few minutes, we were met by Natalia Smirnova, Head of the Department of Psychology and Conflictology at Russian State Social University. Marina Boiko, one of my three primary hosts, works for her, and Natalia was giving me her apartment for the week. Once I understood the situation, I was blown away by the incredible generosity. Natalia drove us to her flat on the western edge of the city and took us to the top floor of a nine story complex of flats. My first reaction was "Wow". It was the nicest apartment I have ever been in. Natalia showed me to the bedroom and invited me to settle in. At this point I still did not understand that she was moving out and that I would have it to myself. I assumed that she was staying there and I would sleep on the couch, which was fine with me. She fixed supper for Arseny and me and the three of us ate a meal of various meats, sausages and fish, boiled potatoes, a chopped vegetable salad and the ubiquitous hot tea. While she cleaned up after dinner, I tried to talk with her, but the language barrier made it difficult. However she tried mightily to respond to my comments and questions. She showed me around the kitchen, gave me some hints on what was available for breakfast and then left. Arseny made sure I was OK, then he left to spend the night with some friends. I was alone, but behind some very securely locked doors. The next morning I figured out how to make tea in a strange kitchen then sweetened it with a big spoon of salt. I threw it out and started over. I was eating bread with stewed apples on it when Arseny came in and had a laugh about my salty tea. We walked to a subway station in the next block and rode it to just north of downtown, by the Svislach River. We walked several blocks, over the river, past the national Opera and Ballet Theatre to the Union of Lawyers building, where I was to speak that day. My hosts had set up a three day seminar for me to teach to trained mediators. The participants paid to attend this seminar on advanced family and divorce mediation skills. I later understood that this was how they got me to Belarus. I had always said that I did not want any pay, but would like my expenses covered. Some of the Community Connections group applied for a State Department grant to pay my way. In January 2015 they were turned down. But being good mediators, they did not take the first "no" as the final answer, and they continued to look for alternate solutions. The one they developed was to host a three day seminar, charge admission and use those funds to pay my airfare. I thought it was brilliant. At the Union of Lawyers, I was shown to a conference room with a large table that seated about 16. Arseny and several others began setting up for my presentation. I met Marina Orlovskaya, the coordinator for Community Connections and other programs for USAID in Belarus. She had played a central role in getting the Belarusian mediators to Raleigh the previous year. The participants in the seminar were: Irina Zuikevich Alexander Sorokoumoff Svetlana Stopesh Mila Visotskaya Natalya Rodenskarya Violetta (Beta) Mensk Elena Kruchok Olesya Knokova Arseny Dzhanashia, Marina Boiko and Oksana Shulga were my hosts and sponsors. My translators were Natallia Demenok, her boyfriend, Dmitry, and Ekaterina Grinevich. On the last day, Oksana Shulga took over most of the translating duties. The attendees were all trained mediators, some having completed the rigorous certification process, which includes 130 hours of training for lawyers and 170 hours for non-lawyers. The youngest were graduate students, the older ones were established lawyers, psychologists or professors in their 30s or early 40s. Everywhere I spoke, most of the audience was women, usually all women with one or two men. Two of my hosts, Arseny and Oksana, I had met in North Carolina. Marina, my Minsk host, arranged for the translators for the next three days. Natallia is a very accomplished student who was completing her undergraduate law studies and will go to Magistracy to get a higher degree. She speaks English fluently. Later, in the two weeks after I met her, she won a Belarusian arm wrestling championship and then won a legal advocacy championship. (For the latter, she was coached by Yulia Amelchenia, a law professor and Community Connections participant.) She had little mediation experience, but was interested enough to volunteer to translate all three days. The first day, Natallia was accompanied by her boyfriend, Dmitry, who also spoke amazingly good English. In the middle of the afternoon, during a break, Dmitry asked me what I thought of his English. I told him that if I met him on the street in Raleigh, I would believe that he was not a local, but not have guessed he was from Europe. I would have probably guessed up north – New York or Boston. His English was so good, it was bad. He used the same improper grammar and slang that American teens and twenties do. In the middle of our discussion, he ended a sentence with "you know", just like my daughter does, but is improper English. My impression was that Natallia had a wider vocabulary, which is understandable since she is a law student and we were talking about legal issues. Both shared the translating duties the first day. The second day, Friday, Ekaterina joined us to help translate. She is a professor of English at Belarusian State University in Minsk and is a friend of Marina. Ekaterina has completed basic training in mediation and is interested in the field, but is not certain that it is something that she is ready to do. In the afternoon, the students did role plays, where two students took on the roles of disputants and one student mediated. They of course mediated in Russian. I had watched the previous day, but could only pick up on language and tone. On the second day Ekaterina went with me and simultaneously translated, giving me the gist of all the conversations. I was very impressed and appreciative. On Saturday, Oksana, my host in Grodno, arrived and took over much of the translating duties. The work was exhausting, so having more than one person translate worked wonderfully. I would speak, relaying an idea, then pause to allow them to translate. It usually proceeded fluidly, except when I would get excited and talk for several paragraphs and forget to stop. Occasionally I would stop and then urge them to translate, warning that the next idea is really long and so they need to do it separately. Several times I was amused that there would be discussion between the students and the translators as to what I had meant. Several of the students were also fluent in English as well as being trained mediators. So they would question the initial translation and a discussion would break out in Russian, of which I of course understood nothing. The first day we started with Meet My Friend, where everyone met a new person then introduced that person to the class. I then talked about the wide array of methods that can be used to resolve family or divorce conflicts. To end the morning, I conducted a role play mediation. To simplify, I mediated between Natallia and Dmitry. I would talk to each in English and the other would translate for the class. I learned something about Belarusian psychology in the process. As I wrote the role play, I knew what it was about – two grad students who had lived together but now as graduation and job prospects was approaching for one, the other felt that a decision to take a job elsewhere and move should have been made jointly. Since he had not consulted her the relationship was over. The issue was the division of the personal property. Or so I thought. Fairly quickly, the discussion began to revolve around the relationship and the lack of communication about plans and desires for the future. The Belarusians where not so interested in possessions as they were in relationships. So I switched gears and mediated a trial reconciliation. In follow up discussion, one local joked, "Since in Belarus we have nothing to divide, we focus on relationships." For lunch we went across the street to the cafeteria in the National Opera and Ballet Theater. The food was very different but very good. After lunch, we talked about mediator styles, presenting a new two by two graphic based upon recent research. Then we talked about collaborative divorce, a concept new to Belarusians. Our last activity was a role play of a divorcing couple. The role plays were in Russian and had been translated initially by me using Google Translate, then cleaned up by Arseny. In one group, Alexander was the mediator and when I came in to observe, he immediately switched to English, which surprised me but I appreciated very much. He was mediating with Svetlana, who speaks fluent English and with Irina, who understands much English but is not comfortable speaking it. So for Irina, Alexander would provide quick translations. At the end of the day, the group was very appreciative and liked best the role plays they had mediated or observed me mediate. After class, one of the Community Connections alumni, Alena Lugovstova, came and picked me up to go to dinner. Alena is a psychologist who works at Belarusian State University. We walked around the Opera and Ballet Theater and over to a small section of town that had been restored to how it might have appeared several hundred years ago. We walked out onto a manmade island, commemorating the dead in the Great Patriotic War. The lake is called Lake of Tears – of the mothers who lost sons. By this time it was snowing lightly, so we headed back into the old restored section and found a nice restaurant. We had several meat, potato pancake and gravy dishes that were delicious. She had me try a local beer. I asked lots of may impertinent questions about life in Belarus, but she was happy to answer and never seemed put off. We then walked across over the river and into downtown. We walked along Independence Boulevard – the main street of downtown Minsk. It was well past dark and snowing lightly off and on. She pointed out many sights, including the KGB building where you should not even step onto the front porch. The avenue was well lit and gleaming in the wet streets. It was beautiful. We ended our walk at a square that had an underground shopping mall beneath. I saw a currency kiosk and exchanged more dollars to rubles. After consulting with Alena about a gift for my volunteer translator, I got a big box of chocolates at a candy store in the mall. We caught the subway across from the mall back to my apartment. When I arrived, Arseny was there. I stayed in the bedroom and he camped on the couch in the living room. The next morning I found out he had brought me some delicious yogurt for breakfast. We started off Friday, Day Two, with Truth or Lie – where a person would say three things about himself or herself, two true and one false. The class then had to guess which was false. It was lots of fun and generated much discussion and teasing. We talked most of the morning about policy issues in structuring family and divorce mediation programs. They were particularly interested in policies to protect the rights of children and the use of school mediation. We had lunch again at the Opera and Ballet Theater café. I sat with three mediators who all spoke some English, but none fluently. It made for interesting conversation, but I was able to divine something of their backgrounds and interest in mediation. During this seminar, I learned that Belarusians take their morning and afternoon tea breaks seriously. We had a separate room set up for tea and coffee, with a number of little cookies and sweets. Everyone got a drink and then stood around chatting and nibbling. The building was quite warm and as I was standing up all the time and moving around, I never wore my coat and wore my sleeves rolled up. So at break, people politely asked if I wanted coffee or tea. I told them I was hot enough and the last thing I wanted was a hot drink. My hosts were very generous about providing me with bottled water. So I had cool water for my breaks. That afternoon we focused on legal issues in mediation – drafting agreements with and without attorneys, enforceability, liability and confidentiality. Our last activity was another family mediation role play, this between an young adult children and the parent with whom s/he lives. We reviewed the agenda for Saturday and made a number of changes to meet their interests. I also informed them that American tradition was that if your boss made you come to work on Saturday, you at least did not have to dress up. So on Saturday I was going to wear jeans and no tie, they could follow suit if they wished. Most did dress down some. Friday evening Arseny, Marina and Mila took me for a walk and to dinner. Mila is a graduate student of Marina's and speaks extremely good English. For much of the rest of my stay, outside of class she was my translator. We walked around the theater but headed in a different direction through a park, then up to Independence Boulevard. We had great fun talking about the various buildings we passed. Arseny knew lots about the area and the history, but relied upon Mila to translate. We ate at a restaurant called Vasilky, the small blue flower that is the Belarusian national flower. The restaurant had quaint décor and very traditional Belarusian food. I had mushroom soup and pancakes wrapped around a type of sausage. The highlight was olivye. It is a salad with chopped vegetables and mayonnaise like dressing. I love it and had it whenever I could thereafter. We talked about the next day's presentation and I called Richmond to see if I could access the Sonexis conference call machine from Belarus, but we could not make it work. My apartment had a clothes washer in the bathroom, but clothes dryers are apparently rare in Belarus. I washed several small loads and then hung them to dry. I worked on writing a role play based on my understanding of Belarusian marriage and divorce. Over breakfast I asked Arseny a number of questions then used the information to hone the role play. I used Google translate and gave it to Arseny, who made corrections and suggestions. Unfortunately, we never got a chance to use it, but I left it behind for them to use in the future. One thing I learned is that a mother and children would never go hungry from lack of support from the father, as the mother's family will always step in and help. Also, due to conditions arising from the end of the Soviet era, housing is relatively cheap. Thus almost everyone owns their own flat, although stand-alone houses, like in American suburbs, are rare and expensive. On Saturday, we started with the Orange Auction Exercise. I had rewritten it for Black Sea oranges, but they informed me that they do not get oranges from the Black Sea area, but from Morocco. We spent the rest of the morning talking about mediating by telephone conference call and answering various questions they had. Oksana Shulga joined us during the morning. For lunch we went to a restaurant around the block, where I had a wonderful soup and salad. In the afternoon we started off with risk analysis, then segued into a number of topics including dealing with emotions, what it takes to be a good mediator, preparing yourself and the clients for a mediation, mediation and therapy and how to grow mediation nationally and as a personal practice. Certificates were presented to the students as well as gifts to me. Marina gave me some Baleam Belorusskii, which roughly translates, "Belarusian Balm". It is a strong liqueur, along the lines of gin, in that it is made of medicinal berries and herbs and has a very strong herbal flavor. They drink it in coffee or tea. My wife thinks it might be good for coughs. I was also given a jar of homemade birch juice from local birch trees by Olesya and some flowers like vasilky, but not, as vasilky were not in bloom. There were many bittersweet good byes. That evening Oksana, Arseny, Marina, Mila and I went across town to a recreation center, but decided we were all too tired to play games, so we went to a restaurant. Fortunately, it was another Vasilky, so I knew what I wanted to eat. We had a great time. At one point, Arseny, Marina and Mila, who were sitting on one side of the table, started laughing. I asked what they were laughing about, and eventually Mila told me that they were talking about her graduate research project. I told her that in my view, if your advisor's response to your research project is to laugh out loud, then you either need a new advisor or a new project. We made plans for the next day, then took a bus back to our respective homes. I found out that we each were staying off of the main road west out of town, we just got off at different stops. The next morning, Sunday, Yulia Amelchenia came to my apartment and took me to a restaurant to meet with Nataliya Tarasova and Oksana Shulga, all Community Connections alumni. Nataliya is a lawyer/mediator in Gomel, a large city in the southeast of the country. She brought me gifts from her home town – a book and some chocolates. Yulia had become friends with my daughter during her stay in North Carolina, so instead of gifts for me, she brought me gifts for Megan – a cap, a scarf (most women in Belarus wore scarves), some chocolate and a small elephant made by her niece of wire and beads. She gave it to me so that she could tell her niece that the elephant did fly, all the way across the Atlantic. After a quick lunch, we went to the street near the central train station (where Arseny and I had caught the bus on Monday to Mogilev) and caught a tour bus. We rode around the city in a double decker bus with head phone audio guides, mine in English. It was my chance to see much of the city of Minsk. The city was completely destroyed in the various battles of the Great Patriotic War. Everything today was built since 1945. Most of the city is of old European style with buildings generally no taller than 4-6 stories. It is a dense city with few vacant lots, but there are many, many parks and green areas that are well maintained. Newer buildings are of more modern style and around the outside of downtown most housing is in high rise flats. The older flats were built in the Soviet era, but when that ended and Belarus became independent, the decision was for families to own their own homes, so each flats was sold off for a nominal amount to the residents. Newer flats are more luxurious, but I was told that the huge, beautiful one bedroom flat I stayed in would probably cost about the same as the tiny one bedroom efficiency condo I own in Cameron Village in Raleigh. The edge of the city is like a cliff, 10 to 15 story apartment buildings at the end of development, then flat farm land or forests. There are no single residence housing like in small towns and suburbs of America. In my tour of Minsk, we when thru one such neighborhood, but to me it had a Potemkin Village feel to it and I was told that the only people who lived there were wealthy and/or well connected. On our tour we went by the Union of Lawyers building. Down the street a block is the American Embassy. Someone has a wicked sense of humor, as the building next door to it houses the Russian Embassy. After our tour, we walked thru several parks, taking pictures and enjoying some very whimsical statues. We wound up at the same underground mall I had visited with Alena on Thursday night. I asked to go back to the chocolate store so I could buy a gift for Ekaterina for her work in translating for me. While there, Yulia and Nataliya found out that I had bought none for myself, so they bought me a large bag. I shared it with folks I met there, but my family polished it off after I got back. Belarus makes good chocolate. After that, Yulia had to go, but Oksana and Nataliya took me to a pub called the Rusty Nail, where 6 of the 10 Community Connections people meet me. Kate Gamzunova, Arseny, Evgeni Kheifets and Elena Zhdanovich joined us. They ordered enormous platters of meats, cheeses, sauces, vegetables and breads to share. Elena took good care of me, explaining what everything was and how to eat it. All was delicious. Kate, a lawyer and mediator in private practice, took me back to my apartment in her car. The next morning, Arseny took me to a bus stop where we met Oksana. Arseny went back to Mogilev while Oksana and I caught a minibus to Grodno. Grodno is an ancient city near the Polish border on the Neman River. Throughout history it has been rules by many different countries – Russia, Poland, Lithuania, Belarus, Sweden, Germany and others. It was captured late in the War and was spared extensive damage. The old city is in fact hundreds of years old. One of the sights I visited was Kolozha Church, an orthodox church dating to 1140. The ride from Minsk took about 2 hours, and I had another good look at the countryside. It is flat and green and fertile. It has some roll to it and the occasional hill, but no significant rises. The land is well maintained and all of it looks either tilled or in forest, no land wasted. We passed many small farming villages or just groupings of houses. The buildings were small and made of wood with metal roofs. They looked neat and efficient but sparse. Horse carts were not common, but were evident. Large locally made farm tractors were used everywhere to pull various loads, including in cities, pulling street cleaning equipment or hauling garbage. In Grodno, we were met by Sasha, Oksana's husband, a German teacher at the same high school their son, Pasha, attends. He took us in their car to their flat. It is a small two bedroom apartment in a Soviet era building in a complex of half a dozen such buildings. Outside and in the halls they are spare and functional, but inside the flats are very neat and well cared for. They have two children, Pasha, a high school senior and Sophia, in elementary school. Sophia sleeps on a hide-a-bed in the living room, which she kindly let me use during my stay. After lunch, Oksana told me that we were going to a meeting at the high school where she has set up a peer mediation program. My initial thought was to say, "I am happy to go to the meeting, but only if no one gives me any presents." But since that would be rude I did not say it. And of course, I was given presents at the high school. I first was greeted by the principal and vice-principals. I was given a tour of the high school. It was quite large. All the students were well behaved and hard at work on their tasks. Of particular interest was a large museum of Belarusian culture in the school. It had a curator who gave me an extensive tour. The theme at that time was that religion and culture make a person complete. The virtues of religion and faith were extolled, in contrast to the Soviet era when all churches had been turned into libraries or museums. One room was filled with beautiful icons. As my wife has long adored iconographic art, I asked if I could take some photographs, which she gladly permitted. After the tour, we went to the auditorium, where I was greeted in a traditional Belarusian fashion with a large spiced bread, of which I ate a piece, and three students who recited a long poem of welcome in Russian and English. In the auditorium I was introduced to about a dozen teachers who had all been trained as mediators and would serve as the mentors of the new mediation program. About 50 students came in, flowed by about a dozen students who were the guests of honor. They had completed the peer mediation training and were about to become peer mediators. The assembly was to recognize them, given them their certificates and announce the beginning of the operation of the program. I was asked to speak.
. The staff took Irina, Oksana and me to a teacher lunch room, where we were served a delicious multi-course meal of pickled salads, soup, pork and potato pancakes with sour cream and sweet rolls for dessert. My love of compote must have proceeded me, for there was lots of fruit juice. We had a wonderful conversation, although all of it had to be translated by Oksana or Irina for me. It was clear that the school valued and appreciated Oksana and what she was doing for them. After going back home and picking up Oksana and Sasha's children, we all drove over to the Kolozha Church. It was a beautiful unique old building, with lots of marks from renovations, added and removed doors and windows. I wanted to see the inside. Although there was a service going on, Oksana thought it would be alright. We went in and the small church was full of people, all standing. The priests were chanting and singing. After a few minutes, they began processing around the outside wall, circling the whole body of worshipers. We hung back, not wanting to interfere, but the leading priest made it clear that we should step inside and join the whole body in worship and blessing. After about half an hour we needed to leave, but I felt welcomed and warmed. During our drive, I learned that a problem in Belarus is too much university capacity. There are more schools and teachers than is needed by the youth population. One way to balance the assets and income is to invite students from overseas. A medical school in Grodno has many students from central Africa. We had dinner around the small kitchen table in the Shulga's flat. Much of it was fixed by Sasha. The next morning when I got up, Sasha and Pasha had gone to school and Oksana had gone to take Sophia to her school. But my pancake breakfast was on the stove, staying warm. I was dressed and ready to go by the time Oksana returned. We went to her university, Yanka Kupala State University, where I met several of her colleagues and graduate students. While waiting to begin my presentation, I hung out in her office, which she shares with five other people – secretary, teachers and grad students. I spoke for about 5 hours, with a break for lunch, to a group of 20 psychology faculty and graduate students. In the morning I covered the history of mediation in NC, definition of mediation and the stages. For lunch, Oksana took me and Kseniya Hil, her top graduate student, to lunch at a very nice restaurant. We discussed mediation and its uses in Belarus, as well as Kseniya's research into what motivates people to volunteer in their communities, particularly in schools and youth activities. Apparently lack of volunteer parental involvement in student activities limits, at times severely, what schools can offer after school. That afternoon I did a role play and then spoke on mediation styles and use of mediation techniques in therapy. I could tell I was not connecting with this group and could not figure out why. The students asked almost no questions and the ones from the faculty had an edge to them. One professor in particular, Lena, asked many tough questions, but was genuinely interested in my answers. I later learned that despite Oksana's passion for mediation, she was not always supported by her faculty. It seemed that Oksana is changing things in a setting where change is not always welcome. The next day we did not go back to the university, but rather went to the high school where I had gone on Monday. There, most of the same graduate students came to my seminar, but we were joined by the high school teachers who had been trained in the peer mediation program, and, to my surprise, Lena. I began with uses of mediation, then we did a fish bowl exercise, where two disputants are mediated by a series of different mediators form the class, each picking up where the last left off. Kseniya Hil was the first to mediate, and did an outstanding job. Another student went next and did OK but got tangled up. Lena volunteered to step in next and showed a real mastery of asking questions. She was at times a bit more direct than some mediators would be, but having never had mediation training other than my bit the previous day, she was amazingly good. After lunch we talked about asking good questions, other communication skills and writing good agreements. We ended with Orange Auction and debrief. The leaders that developed on each team did a great job of working their way thru the problem then negotiating a solution while the auction was going on. The energy and positive feelings were much better on this day and we all had a great time sharing mediation experiences. After class, Oksana took me to the shopping district for me to buy another suitcase, because I had been given so many gifts, I could not get them back to the US in the bag I brought. That night Oksana washed some dress shirts for me, to get me thru the rest of the week. To my shock, they were ironed when she gave them back, as I never iron my shirts. She spoiled me. As I was packing, she took the family icon off of her piano and gave it to me, saying that she knew my wife would appreciate an icon. I protested that I could not take her family icon. She refused to let me leave without it. It sits in a place of honor above our fireplace. Thursday morning, instead of catching a bus back to Minsk, Sasha and Sophia decided to take the day and join us on our journey. From the front seat I could observe the Belarusian traffic habits. The road we were on was a wide, paved two lane road. However, the way they used the road was as if it was four lanes. If a car approached you from the rear, you moved over to the outside edge and let the car behind pass in the center of the road. If you met a car passing in the center, you moved over to your outside edge, creating a three lane road. this required a level of cooperation and toleration that I have never seen in America and I doubt we could make work here. In Minsk, we went to Russian State Social University, where Marina greeted us and proudly showed us around her department and introduced us to her colleagues, who were excited to see us. I promised the librarian a copy of the green book once I got home. I spoke to a large auditorium of English, psychology, law and history students on mediation and its uses in the US. A trick that made all these presentations go smoothly was that a week before I left, Arseny suggested that I put together some power point slides. I am not a power point guy, but I thought I would try. I adapted my outlines and notes on a dozen subjects to power point. I then thought – this is completely useless as it is in English and they read Russian. So I ran each slide thru Google Translate and made half of each slide English and half Russian. (After I got there, the first day, Arseny kindly went thru the slides and corrected the grammar.) So for each presentation, I just cued up on my flash drive the 3-5 slides I would use and it helped the students follow along and helped keep my talks organized. After my talk, I posed for many pictures with students, then went to an elaborate tea with the faculty. While at tea, some students came in and gave me a dozen roses. The first time I ever got roses for performing. As I could not take them on my flight, I gave them to my hostess, Natalia Smirnova, and asked her to put them in her flat once I had vacated. Marina had done a splendid job of plastering my picture all over the university, inviting people to my talk. As I was leaving, she told me that someone from the state security police had called the university to find out why an American was speaking. They explained who I was and my topic and that seemed to satisfy the police. There were no more calls, but my guess is that the person who got the first call did not enjoy the experience. Kate Gamzunova picked up Oksana and me, to take me to my next engagement. I realized once we were in the car, that she was dropping Oksana at a subway station and then we would continue on. I gave a quick good bye to my dear hostess and we were off. I later wrote her to say that I did not give her a proper good bye, but she responded if it had been a longer good bye, she would have cried. Kate took me to the mediation center that she runs with Elena Zhdanovich. They are one of three certified mediation training providers and continue to work with their new mediators. With Kate's translation I spoke to eight of them about uses of mediation in the US, program design and some ideas on building a mediation practice both individually and how to get mediation to be used more in the courts and by lawyers. They were very receptive and excited about prospects for mediation, although it was clear that they were eager to get on with doing more actual mediations. When I got back to my flat, I realized that although I had eaten lots of tea and cakes, I had never eaten dinner. Feeling adventurous, I left the flat and started walking down the main street looking for a food store. After a couple of blocks, I cut down a side street that had lots of lights and spotted people walking toward me, carrying what looked like shopping bags, I followed the flow up stream and found a grocery store. I wander around in the store, checking out various options. I got some yogurt and a sweet roll for breakfast and something that looked like olivye salad. Although the store clerks clearly knew I spoke no Russian, they were kind and helpful with a smile. The salad was good, but I discovered that it was heavy with fish and so I did not eat more than half my large serving. But my first solo adventure into Belarus had gone smoothly and all was great. The next day I was picked up again by Yulia Amelchenia and taken to the Union of Lawyers. There I met with another of the certified training groups, led by Yulia and Evgeni Kheifets. I spoke to a group similar to the previous night, newly trained mediators excited about the prospects of mediation but frustrated as to how slow the work was growing. I gave them all the advice I had, but told them there was no magic bullets. They were where we were twenty years ago. It would not twenty years for them to catch up, but it would take some years. New laws are begin considered by the legislature to encourage or mandate the use of mediation in certain types of civil court cases. I saw several of my students from the seminar the previous week and was heartened when at the end, one lady who asked a lot of questions said, "I should have come to the seminar last week." At this presentation I had the translation services of Daria Denisiuk, a young lawyer with an international firm in Minsk. She and one of her partners, Alexy Anischenko, took me to lunch then back to my flat. I spent the afternoon packing and getting ready to fly the next morning. Marina picked me up and took me to a restaurant across from the ballet. There we met Yanina Lebedeva, a friend of hers who spoke fluent English. Marina had bought me tickets to the ballet, knowing that I attended in North Carolina regularly. But as her English is limited, she brought her friend to help out. We had a quick bit of supper, during which Svetlana, from the seminar, came by and gave me yet another gift (! ), an intricately worked leather wallet. The ballet, La Esmeralda, was well danced with a live orchestra. The theater has been renovated in recent years and is exquisite with marble floors, carved stone and worked gold. ​Early the next morning Oksana's brother, who has a car, and Marina picked me up and took me to the airport. They got me to the right gate, headed thru customs. Once I was in the departure lounge, I realized I was leaving a big part of my heart in Belarus, I got a tear in my eye. I was eager to get home to my family, but sad to leave my dear mediator friends.